In Chapter 1, you learned what ASP.NET is, and what it can do – you even know how to create a simple ASP.NET page. Don’t worry if it seems a little bewildering right now, because, as this book progresses, you’ll learn how to use ASP.NET at more advanced levels. Note that you can download these chapters in PDF format if you’d rather print them out and read them offline. We’ll also cover two of the "built-in" languages supported by the .NET Framework: VB.NET and C#. As this section begins to unfold, we’ll explore the differences, similarities, and power that the two languages provide in terms of creating ASP.NET applications. So, what exactly makes up an ASP.NET page? The next few sections will give you an in-depth understanding of the constructs of a typical ASP.NET page. ASP.NET pages are simply text files with the .aspx file name extension that can be placed on an IIS server equipped with ASP.NET. When a browser requests an ASP.NET page, the ASP.NET runtime (as a component of the .NET Framework’s Common Language Runtime, or CLR) parses and compiles the target file into a .NET Framework class. The application logic now contained within the new class is used in conjunction with the presentational HTML elements of the ASP.NET page to display dynamic content to the user. Sounds simple, right? It’s important to remember that ASP.NET pages are just text files with an .aspx extension that are processed by the runtime to create standard HTML, based on their contents. Presentational elements within the page are contained within the <body> tag, while application logic or code can be placed inside <script> tags. Remember this pattern from the sample at the end of the previous chapter? Figure 2.1 illustrates the various parts of that page. Figure 2.1. All the elements of an ASP.NET page are highlighted. Everything else is literal text and HTML tags. As you can see, this ASP.NET page contains examples of all the above components (except server-side includes) that make up an ASP.NET page. You won’t often use every single element in a given page, but you should become familiar with these elements, the purpose that each serves, and how and when it’s appropriate to use them. The Page directive, in this case, specifies the language that’s to be used for the application logic by setting the Language attribute appropriately. The value provided for this attribute, in quotes, specifies that we’re using either VB.NET or C#. There’s a whole range of different directives; we’ll see a few more later in this chapter. Unlike ASP, in ASP.NET, directives can appear anywhere on a page, but are most commonly written as the very first lines. Both of these code snippets contain comments – explanatory text that will be ignored by ASP.NET, but which serves to describe how the code works. In VB.NET code, a single quote or apostrophe (') indicates that the remainder of the line is to be ignored as a comment. In C# code, two slashes (//) does the same. C# code also lets you span a comment over multiple lines by beginning it with /* and ending it with */. If you don’t specify a language within the code declaration block, the ASP.NET page will use the language provided by the language attribute of the Page directive. Each page may only contain code in a single language; for instance, it is not possible to mix VB.NET and C# in the same page. You can use code render blocks to define inline code or inline expressions that execute when a page is rendered, and you may recognize these blocks from traditional ASP. Code within a code render block is executed immediately as it is encountered, usually when the page is loaded or rendered for the first time, and every time the page is loaded subsequently. Code within a code declaration block, on the other hand, occurring within script tags, is only executed when it is called or triggered by user or page interactions. There are two types of code render blocks: inline code and inline expressions, both of which are typically written within the body of the ASP.NET page. Inline code render blocks execute one or more statements and are placed directly inside a page’s HTML within <% and %> characters. Inline expression render blocks can be compared to Response.Write() in classic ASP. They start with <%= and end with %>, and are used to display values of the variables and methods on a page. The first line represents an inline code render block and must contain complete statements in the appropriate language. Here, we’re setting the value of the Title variable to the string Zak Ruvalcaba. The last line is an example of an inline expression render block used to write out the value of the Title variable, Zak Ruvalcaba, onto the page. At the heart of ASP.NET pages lies the server controls, which represent dynamic elements that your users can interact with. There are four basic types of server control: ASP.NET controls, HTML controls, validation controls, and user controls. All ASP.NET controls must reside within a <form runat="server"> tag in order to function correctly. The only two exceptions to this rule are the HtmlGenericControl and the Label Web control. We can access HTML elements easily from within our code: we can change their characteristics, check their values, or even dynamically update them straight from our server-side programming language of choice. ASP.NET controls retain their properties even after the page has been processed. This process is known as view state. We’ll be covering view state later in this chapter. For now, just know that view state prevents the user from losing data that has already been entered into a form once it’s been sent to the server for processing. When the response comes back to the client’s browser, text box values, drop-down list selections, etc., are all retained through view state. With ASP.NET controls, developers are able to separate the presentational elements (everything the user sees) and application logic (dynamic portions of the ASP.NET page) of a page so that each can be considered separately. Because ASP.NET is all about controls, we’ll be discussing them in greater detail as we move through this book. For instance, in the next few chapters, we’ll discuss HTML controls and Web controls (Chapter 4, Web Forms and Web Controls), Validation controls (Chapter 5, Validation Controls), Data controls (Chapter 9, The DataGrid and DataList Controls), and so on. Server-side comments allow you to include, within the page, comments or notes that will not be processed by ASP.NET. Traditional HTML uses the <!-- and --> character sequences to delimit comments; anything found within these will not be displayed to the user by the browser. ASP.NET comments look very similar, but use the sequences <%-- and --%>. Now, the ASP.NET runtime will ignore the contents of this comment, and the value of the Title variable will not be changed. Server-side include directives enable developers to insert the contents of an external file anywhere within an ASP.NET page. In the past, developers used server-side includes when inserting connection strings, constants, and other code that was generally repeated throughout the entire site. Note that although server-side includes are still supported by ASP.NET, they have been replaced by a more robust and flexible model known as user controls. Discussed in Chapter 16, Rich Controls and User Controls, user controls allow for developers to create a separate page or module that can be inserted into any page within an ASP.NET application. As you can see in the bold code, literal text and HTML tags provide the structure for presenting our dynamic data. Without them, there would be no format to the page, and the browser would be unable to understand it. Now you should understand what the structure of an ASP.NET page looks like. As you work through the examples in this book, you'll begin to realize that in many cases you won't need to use all these elements. For the most part, all of your development will be modularized within code declaration blocks. All of the dynamic portions of your pages will be contained within code render blocks or controls located inside a <form runat="server"> tag. In the following sections, we'll outline the various languages used within ASP.NET, talk a little about view state, and look at working with directives in more detail. <asp:Button id="btnSubmit" Text="Click Me" OnClick="Click"
Figure 2.2. ASP.NET supports view state. When a page is submitted, the information within the controls is preserved. This is a standard HTML hidden form field with the value set to the encrypted data from the form element. As soon as you submit the form for processing, all information relevant to the view state of the page is stored within this hidden form field. Speaking of directives, it's time we took a closer look at these curious beasts! For the most part, ASP.NET pages resemble traditional HTML pages, with a few additions. In essence, just using an extension like .aspx on an HTML file will make the .NET Framework process the page. However, before you can work with certain, more advanced features, you will need to know how to use directives. Defines page-specific attributes for the ASP.NET page, such as the language used. Makes functionality defined elsewhere available in a page through the use of namespaces. You will become very familiar with this directive as you progress through this book. As you will see in Chapter 16, Rich Controls and User Controls, you would use this directive to link a user control to the ASP.NET page. As we saw in the previous chapter, .NET currently supports many different languages and there is no limit to the number of languages that could be made available. If you're used to writing ASP, you may think the choice of VBScript would be obvious. With ASP.NET however, Microsoft has done away with VBScript and replaced it with a more robust and feature-rich alternative: VB.NET. ASP.NET's support for C# is likely to find favor with developers from other backgrounds. This section will introduce you to both these new languages, which are used throughout the remainder of the book. By the end of this section, you will, I hope, agree that the similarities between the two are astonishing - any differences are minor and, in most cases, easy to figure out. Traditional server technologies are much more constrained in the choice of development language they offer. For instance, old-style CGI scripts were typically written with Perl or C/C++, JSP uses Java, Coldfusion uses CFML, and PHP is a language in and of itself. .NET's support for many different languages lets developers choose based on what they're familiar with, and start from there. To keep things simple, in this book we'll consider the two most popular, VB.NET and C#, giving you a chance to choose which feels more comfortable to you, or stick with your current favorite if you have one. 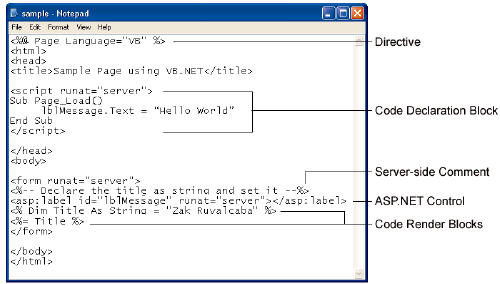 Visual Basic.NET or VB.NET is the result of a dramatic overhaul of Microsoft's hugely popular Visual Basic language. With the inception of Rapid Application Development (RAD) in the nineties, Visual Basic became extremely popular, allowing inhouse teams and software development shops to bang out applications two-to-the-dozen. VB.NET has many new features over older versions of VB, most notably that it has now become a fully object-oriented language. At last, it can call itself a true programming language on a par with the likes of Java and C++. Despite the changes, VB.NET generally stays close to the structured, legible syntax that has always made it so easy to read, use, and maintain. The official line is that Microsoft created C# in an attempt to produce a programming language that coupled the simplicity of Visual Basic with the power and flexibility of C++. However, there's little doubt that its development was at least hurried along. Following legal disputes with Sun about Microsoft's treatment (some would say abuse) of Java, Microsoft was forced to stop developing its own version of Java, and instead developed C# and another language, which it calls J#. We're not going to worry about J# here, as C# is preferable. It's easy to read, use, and maintain, because it does away with much of the confusing syntax for which C++ became infamous. In this chapter, we started out by introducing key aspects of an ASP.NET page including directives, code declaration blocks, code render blocks, includes, comments, and controls. As the chapter progressed, you were introduced to the two most popular languages that ASP.NET supports, which we'll use throughout the book. In the next chapter, we'll create more ASP.NET pages to demonstrate some form processing techniques and programming basics, before we finally dive in and look at object oriented programming for the Web. Look out for more chapters from Build Your Own ASP.NET Website Using C# And VB.NET in coming weeks. If you can't wait, download all the sample chapters, or order your very own copy now! Involved in the Web since 1995, Zak is founder of and advisor to Module Media, a full service design and development firm in San Diego. He is author of Ã¯Â¿Â½The Ten Minute Guide to Dreamweaver 4Ã¯Â¿Â½ and Ã¯Â¿Â½Dreamweaver MX UnleashedÃ¯Â¿Â½, and SitePoint's own Build Your Own ASP.NET Website Using C# and VB.NET.